Spring - Cut out old flower heads and dead stems hydrangeas. 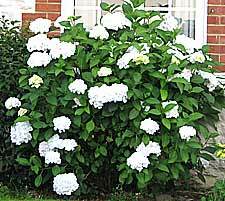 Spread 50g of a general fertilizer over the soil at the base of the hydrangea plant. Cut out any leafless stems. Early autumn is the best time to plant hydrangeas. H. macrophylla Adria: A Compact Sea-blue Mophead variety flowering from July-August. 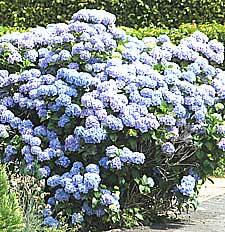 Generale Vicomtesse de Vibraye: AVivid Rose or Bright Blue Mophead Hydrangea. H.Aspera Strigosa: Lilac and pale purple Lacecap flowering from July - September. Involucrata: A dwarf white Lacecap with a blue centre. Fireworks: Double white star like florets on long stems. Tokyo Delight: Small white lacecap which turns pink as it ages. Hydrangeas are a popular choice of shrub for the garden - they provide plenty of colour from mid summer through to the end of Autumn when the shrub border is so often short of flowers. Hydrangea features glossy light green oval leaves and hydrangea flowers appear in clusters of single coloured flowers in shades of blue, purple, red, white and pink. The common hydrangea, H.macrophylla, has spawned into a huge range of different types and varieties of hydrangea - the two main types are the lacecap hydrangeas and the hortensias or mophead hydrangeas. 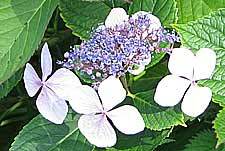 Lacecap and mophead hydrangeas are descended from shrubs native to a small area of Japan on the east coast. Also known as florist's hydrangea, hortensia with their large ball like blooms were originally bred as pot plants and were unsuitable for growing outdoors. Now there are numerous varieties available for the garden. Lacecaps bear flat open flowerheads, the impact of their flowerheads is softened by the combination of a central plate of fertile flowers surrouded by a ruff of the larger petalled flowers. Lacecap hydrangea are similar in appearance to the shrub viburnum. Hydrangeas can be grown in most areas of the garden - they grow best in partial shade but will tolerate full sun. They grow best in a well drained, rich soil protected by a wall or fence to protect them from severe winter weather. Hydrangeas suit shrub borders, or grow well as single specimen plants. Dig a hole as deep as the shrub's root ball and twice as wide. Break up the soil with a fork and dig in a 2cm of well rotted compost. 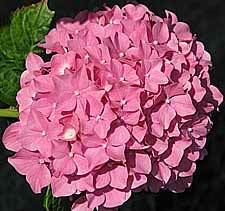 Remove the hydrangea plant from its container and carefully loosen the soil around the root ball. Place the shrub in the prepared hole so that the stem is at ground level - add soil to raise the plant if necessary. Fill the hole with soil - packing the soil around the roots to eliminate any pockets of air. Water thoroughly and apply a mulch of compost. Th change the colour of the flowers of a hydrangea to blue add aluminium sulphate to the soil. If you want pink flowers - add lime to the soil. Hydrangeas require only minimal pruning. To prune a hydrangea remove the dead flower heads of Mophead varieties in March - not in autumn. Prune to just above the nearest outward facing bud.